Skeptics are right that the new crop of thinkers offer a bigger change in tone than substance. That change is reason enough for optimism. The conservative intellectual Reihan Salam has shrewdly observed that people trying to reform institutions must choose between an “outside game” that challenges existing leadership—and an “inside game” that woos existing leaders. On Sunday, Sam Tanenhaus profiled a group of self-described "reform conservatives" in The New York Times Magazine. Tanenhaus, author of an outstanding biography of Whittaker Chambers, knows his way around American conservatism. He has fiercely criticized the “revanchism” of the right-wing militancy of the first Obama term. This time, however, Tanenhaus spoke in respectful praise. The art director went even further: The magazine photographed 11 of the profiled people in an 18th-century hall, crumpled papers at their feet, an homage to J.L.G. 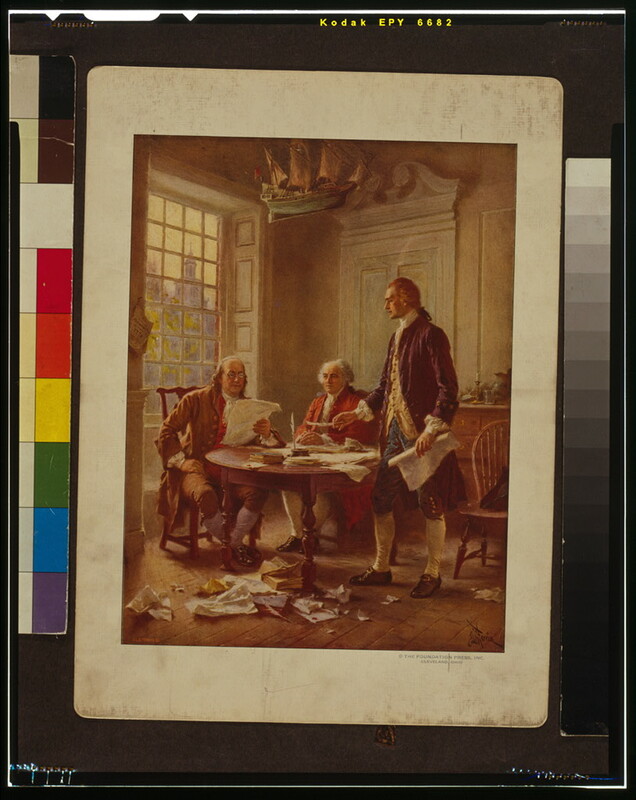 Ferris’s well-known painting of the drafting of the Declaration of Independence. Tanenhaus’s reformers constitute very much an “inside” group. Most of them work at think tanks that were closely associated with the Romney-Ryan ticket of 2012, others at a policy network organized by the chief of staff to outgoing House Majority Leader Eric Cantor. As a group, they do not deviate very far from current Republican orthodoxy. But they urge that the next round of Republican tax cuts favor parents rather more and high-income earners rather less. They urge that the Earned-Income Tax Credit be replaced by more narrowly targeted wage subsidies. They are interested in following the lead of David Cameron’s U.K. government, which has consolidated many social programs into a “universal credit” for needy people. There is no equivalent here of, say, the willingness of the New Democrats of the 1980s to tangle with teachers’ unions. Why, no. This is another edition of simple answers to simple questions. More specifically, the “reform conservatives” seem mainly to be offering supposedly new ideas for the sake of being seen to offer new ideas. And there isn’t much there there; can you find anything in the Tanenhaus piece that sounds like an important new idea rather than a minor tweak on the current conservative catechism? I can’t. I mean, converting federal poverty programs into bloc grants is supposed to be a major departure? It’s true: Thus far, conservative “reform” offers more a change in tone than a change in direction. Yet it is no less important for all that. Over the past five years, the American right has veered toward a reactionary radicalism unlike anything seen in American party politics in modern times. I won’t recapitulate the story here; it’s too well known. For present purposes, the important thing is that the titular leadership of the Republican Party has been overwhelmed by this reactionary surge. Some have joined. Some have been swept aside. Some have experienced both—as indeed happened to the reformers’ main congressional patron, Eric Cantor. As the finishing touches were being applied to Tanenhaus’s essay, Cantor lost his primary and his job. Like Cantor himself, many of the 11 people profiled by Tanenhaus have skittered back and forth between radicalism and reform. Many of the reformers are employed by the American Enterprise Institute. In the first Obama term, AEI strongly identified itself with the “makers versus takers” rhetoric of the radicals. AEI’s president published a book on the theme. It was at AEI that Representative Paul Ryan delivered his famous speech warning that the United States was nearing a tipping point at which the “makers” would outnumber the “takers,” condemning the country to an inescapable future of government dependency. (AEI even made a cartoon to explain the concept to 8-year-olds!) Almost every single one of Tanenhaus’s reformers backed Ryan at the time—and even now, reformers seek to assure skeptical party radicals that the reform agenda will deliver more ideology, not less. So there is a basis for skepticism about how much change, really, is swirling through the reformers’ institutional water coolers. Yet as a veteran myself of some of these internal debates—I was fired from AEI in 2010 for saying things that the reformers are edging toward today—I do see cause for optimism in the reformist turn by elite conservatives. What matters most about the reformers is not the things they say but the things they don’t. They don’t abuse the long-term unemployed. They don’t advocate tighter monetary policy in the midst of the worst slump since the 1930s. They don’t urge an immigration policy intended to drive wages even lower than they have already tumbled. They don’t pooh-pooh the risks of a government default on its obligations, as many conservatives did when radicals in the GOP forced debt-ceiling confrontations in 2011 and 2013. They don’t blame budget deficits for the slow recovery from the crisis of 2009. They don’t shrug off the economic and social troubles of 80 percent of the American nation. Conservatives dominated American politics in the 1970s and 1980s because they offered workable solutions to broadly experienced problems: crime, inflation, slow growth, the Soviet threat. In recent years, however, conservatives seemed to have less to say to the nation. Stagnant wages, rising personal indebtedness, long commutes, health-care costs, climate change—these new challenges did not elicit new thinking. The reform conservatives seem more open to the new. This is progress. If the policy agenda that follows remains cautious, remember: These conservative reformers aren’t trying to change the world. They’re trying to change a political party. You don’t change people’s minds by telling them they are wrong, even—or especially—if they are wrong. You change their minds first by establishing an emotional connection with them. Next you ratify their existing beliefs. When it comes time to introduce a new idea, you emphasize its consistency with things they already believe. This is what the reform conservatives are doing, or have begun to do. If they seem to be moving slowly, well, take it from me: It’s no good being even 10 minutes ahead of the times.